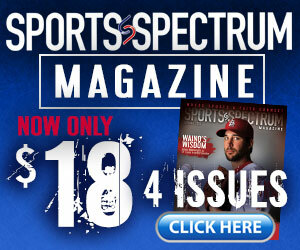 The following article is featured in the latest edition of Sports Spectrum. To get a full subscription to the magazine, including all of its online content and articles from the past 30 years, click here to subscribe. Ryan Hall had not finished a single marathon in nearly three years. This was more than disappointing, though he tried not to pay attention to the fans and media who said so. Since his exhilarating debut in the London Marathon in 2007 (when he ran the fastest first marathon by an American), the marathon was Hall’s race. He ran all over the world training and competing as a professional runner, and before the age of 30 had raced in two Olympics and held the U.S. records for the fastest half marathon and the Boston Marathon. For a time, his running prospects were as golden as his signature blond shag. Hall was the U.S. long-distance force to be reckoned with. Even Kenyans, long-dominant in distance racing, respected him. “One of my Kenyan buddies told me, ‘You’re famous in Kenya. You’re the white guy everyone knows about,'” Hall told a USA Today reporter in 2012. 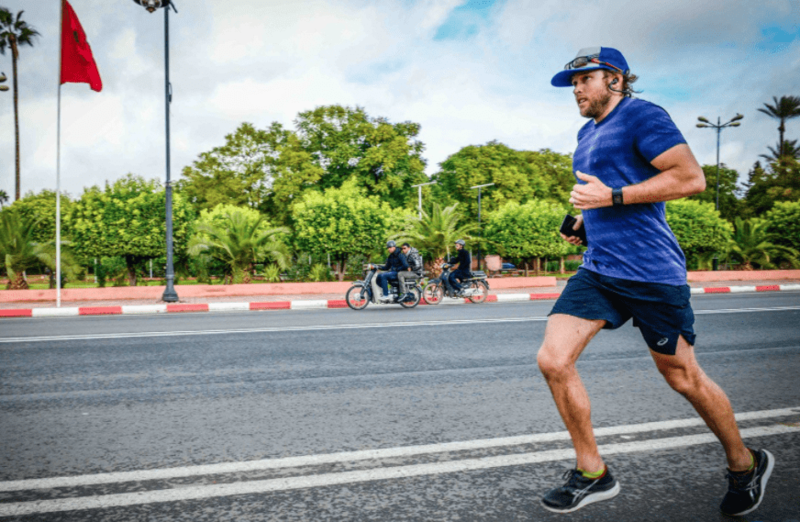 Beginning in 2012, though, his races were cut short due to injuries: plantar fasciitis, then issues in his right hamstring and hip caused him to drop out of the 2012 Olympic Marathon 10 miles in. Later, he tore his left, then right quadriceps muscles, followed by a stress fracture of his sacrum. “It was just getting to the point where I was like, ‘This is pretty ridiculous,’” Hall says. 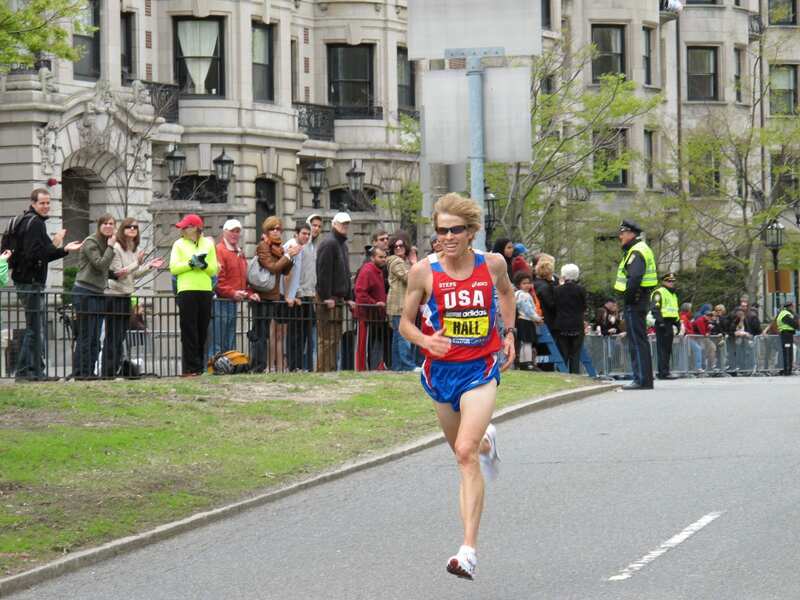 He withdrew from the 2012 New York Marathon, citing continuing injuries. Then he pulled out of the Boston and New York Marathons in 2013, for the same reasons. His last complete race was the 2014 Boston Marathon, where he finished in 20th place. Though he hoped to make a comeback at the 2015 Los Angeles Marathon, he made it halfway before having to pull out. Even when the injuries healed, a heavy fatigue took their place, and impeded his training. In the past, Hall regularly ran over 100 miles a week. Now he felt exhausted and had to turn around after 15 minutes of jogging. He lingered in training for months, hoping his energy would improve. After months of deliberation and prayer, Hall announced the inevitable end of his competitive running career. He retired in January of 2016. Two months later, he got an unusual text message. Hall was lifting weights in his garage when he heard his phone buzz. “Hey, I’m doing this crazy challenge next year: Seven marathons in Seven days on Seven continents,” the text said. It was from Matthew Barnett, one of Hall’s friends, and a pastor and founder of the Dream Center, a Christian mission and service center in Los Angeles. Barnett wanted to run the 2017 World Marathon Challenge to raise funds for the Dream Center, and asked if Hall was interested. Even for the best marathoners in the world, finishing the World Marathon Challenge is a formidable feat. Conventional wisdom (and Runner’s World) says to spend anywhere from two to four weeks recovering from a single marathon. World Marathon Challenge participants would have less than a day between the seven marathons. And Hall was not exactly in racing form. It’s not that he wasn’t fit; on the contrary, Hall was in top shape. Just not for distance running. Needing a non-running athletic outlet after retirement, Hall had gotten into weightlifting, and it had become a passion. Previously 5’10” and 130 pounds, Hall once had the wiry body type that most elite marathoners dwindle to. Former coach Terrence Mahon once observed that Hall looked like a “white Kenyan,” for his lanky frame that mirrored elite east African racers. While Hall’s energy improved, the small amount of running he still did—a relaxed 30 minutes a few times a week—began to feel different. “I don’t ever have the feeling I used to have where I feel like a deer running through the forest; now I feel like a lumbering bear or something,” Hall says. The extra weight, though healthily acquired, posed a new risk: it could throw off his mechanics and running stride, leading to injury. The distance itself was the other uncertainty. It can take months to build up the mileage and stamina required to finish a single marathon. But seven in a row, on different continents? When he hadn’t finished one in almost three years? Nevertheless, Hall began to think about taking on the Challenge. Though his decision to retire had involved careful consideration, Hall still didn’t feel satisfaction with the conclusion of his running career. Hall’s dream for retiring involved running a final race, finishing strong, then removing his racing shoes once he crossed the finish line and leaving them there. Not to mention he was feeling a special calling to try the Challenge. “I had this feeling of, ‘God’s giving me the desire to actually want to do this,’ which sounded crazy because you don’t not run and then just sign up for something like that,” Hall says. The last time he had felt that calling to pursue an athletic dream was in high school. At age 13, Hall tried distance running for the first time. Previously a baseball, basketball, and football player in his hometown of Big Bear Lake, California, Hall felt an urge to run one day, and followed it. Raised in a Christian family, Hall was certain he knew Whom it came from. “God gave me this crazy desire to go out on this epic run. It would be the first one I’d ever done as a 13-year-old basketball player, and I ran 15 miles around the lake with my dad,” Hall says. He remembers collapsing on the couch in his living room after the lake run, and feeling that God had big plans for him, and that they involved running. “I really felt like [God] was telling me, ‘I’ve given you a gift to run with the best guys in the world, and I’ve given you that gift so you can help other people.’ So from that moment on I was fully going after that vision that God had put in my life,” Hall says. Hall pursued this calling wholeheartedly, even as his social life became a casualty. He lost friends because he was no longer doing the same activities. Hall’s father was a teacher at his high school, and gradually Hall found himself eating his lunch in his dad’s classroom, because he had no friends to eat with. A few years later, as a scholarship athlete in his sophomore year at Stanford, Hall saw God change his life again. Hall was struggling academically, was injured and not performing well athletically, and health-wise was constantly ill. This unbalance segued into a heavy blanket of depression. He dropped out of Stanford the winter quarter of his sophomore year, and returned home. When his depression didn’t improve, his pastor asked him to return to what God was calling him to do. Hall knew that meant going back to Stanford, and back to running. That’s when he felt God working on his heart, and changing his perspective. “I went back to Stanford [that spring]. And I didn’t start winning every race or anything like that, but things just gradually started to shift, and I started to see the fruit of what was going on inside of me. I started to see it in my academics, in my running, and in the general amount of joy that I was having in my day-to-day living,” Hall says. Finding his identity outside of athletics prepared Hall for the next big transition of his life: retiring from the marathon. Professional athletes leaving their sports can often trigger an identity crisis and loss of purpose. Not in Hall’s case. 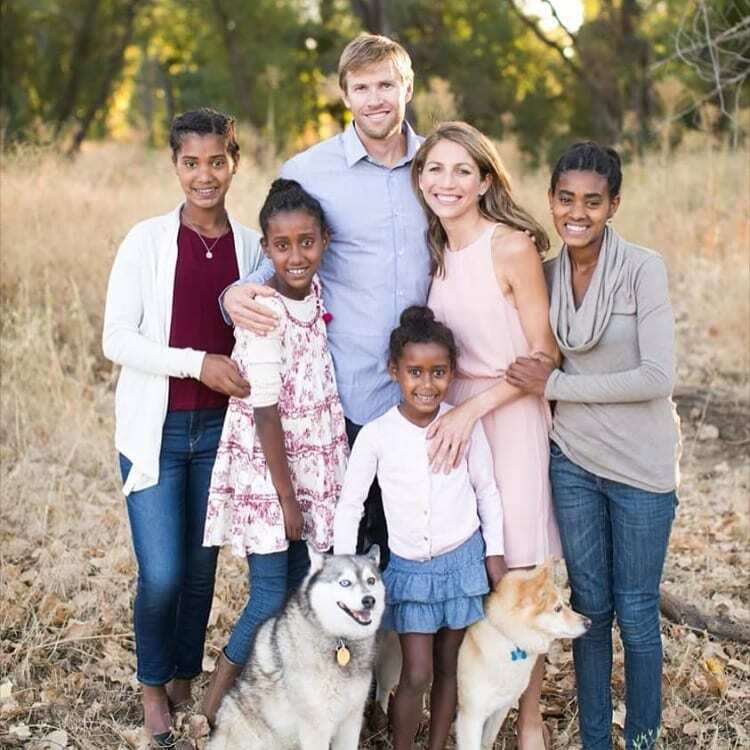 Hall and his wife, Sara (another professional runner who Hall met at Stanford) adopted four Ethiopian sisters between the ages of 6 to 16–Lily, Jasmine, Mia, and Hana—in the fall of 2015. Aside from raising his daughters, other pursuits after his retirement included working on the nonprofit Hall Steps Foundation he started with Sara, coaching her through her own marathons, and continuing to make appearances at athletic events across the U.S. Even with a busy daily life and little proper training, though, Hall still felt an urge to run the World Marathon Challenge. With the blessing of his family, he said yes to Barnett and the Challenge, and in January 2017, flew to Antarctica. “What’s going on, guys? Ryan here.” So begins each video in a series that chronicles Hall’s marathons and journey around the world for the Challenge. For each marathon, Hall pulled out his phone and filmed himself before, during and after. Marathon #1 took place on top of the Union Glacier in Antarctica. Hall ran and slipped through the snow, and finished an hour and 22 minutes behind his best marathon time. The surprise to him, though, was that he was able to finish at all; he now had hope that completing the challenge was possible. For the next five days in sequence, he flew to Punta Arenas, Chile, Miami, Florida, Madrid, Spain, Marrakesh, Morocco, and Dubai, United Arab Emirates, finishing the day’s marathon in each country and continent. His times were slow, his strides were shorter. His legs were “trashed” and he was “suffering like I’ve never suffered before” (especially in Madrid). Each day brought fewer hours of sleep and recovery. By the time Hall reached Marathon #7 in Sydney, Australia, he knew he was hurt. A burning pain in his hips from the previous day’s marathon in Dubai hadn’t gone away. He could still run, though, and decided he would finish his last marathon. When Hall checked in for his video log at Mile 23, he wasn’t running. The fiery pain in Hall’s hips turned out to be a stress fracture, discovered via MRI once Hall returned to the United States. “At the end of the race I ended my last ever marathon the way I always envisioned. I stopped, pulled off my shoes, and left them on the finish line. It was an emotional goodbye as the marathon has meant so much to me throughout the years,” Hall wrote in his blog post about the World Marathon Challenge. Hall’s final marathon was more than double the amount of time of his fastest race. But he had completed more marathons in seven days than he had in the past eight years. And between Barnett, Hall, and the World Marathon Challenge, $1.4 million was raised for the Dream Center. When Hall returned from the Challenge, he began volunteering as an assistant track coach at two of his daughters’ schools. Now he cheers on his eldest, Hana, as she competes in local track meets. “No matter what place she’s in or how fast she’s going, I get proud just watching her run. It helped me see how God feels, I think, when He watches me run. He’s proud of me regardless of how fast I’m going or what place I’m in,” Hall says.